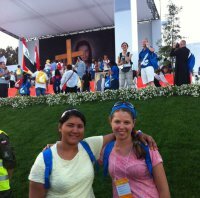 This year we went with students to see the Holy Father Pope Francis with millions of other young people in Cracow, Poland for the World Youth Day. It was challenging to sleep in tents and combat the rain and mud, but also rewarding to see the Pope and go through such a fantastic experience. There were people from all nations joined together to pray with the Holy Father. An experience to remember forever!